The Gap Model of Service Quality (aka the Customer Service Gap Model or the 5 Gap Model) is a framework which can help us to understand customer satisfaction. The model shows the five major satisfaction gaps that organizations must address when seeking to meet customer expectations. The model was first proposed by A. Parasuraman, Valarie Zeithaml, and Leonard L. Berry in 1985. In the Gap Model of Service Quality, customer satisfaction is largely a function of perception. If the customer perceives that the service meets their expectations then they will be satisfied. If not, they’ll be dissatisfied. If they are dissatisfied then it will be because of one of the five customer service “gaps” shown below. As we explain the Gap Model concept we’ll use two example companies to show how each gap might manifest itself in two very different companies. The two example companies we’ll consider are Netflix and Pizzahut. The diagram below shows a visual representation of the Gap Model of Service Quality. To use the model, an organization should measure each of these gaps and then take steps to manage and minimize each gap. Let’s examine each of the five gaps in turn. The knowledge gap is the difference between the customer’s expectations of the service and the company’s provision of that service. Lack of management and customer interaction. Lack of communication between service employees and management. Failure to listen to customer complaints. If Netflix were to suffer from this gap then it could be because they don’t offer the right amount of newer titles to their customer. If Pizzahut were to suffer from this gap then it could be because they don’t offer pecan pie. In both cases, customers expect these things but they simply aren’t offered. The policy gap is the difference between management’s understanding of the customer needs and the translation of that understanding into service delivery policies and standards. Lack of customer service standards. Failure to regularly update service level standards. If Netflix were to suffer from this gap then it could be that they offer all the right shows but the streaming quality level isn’t high enough. If Pizzahut where to suffer from this gap then it could be they offer pecan pie but the quality isn’t as good as people expect. This gap causes customers to seek a similar service elsewhere but with better service. The delivery gap is the difference between service delivery policies and standards and the actual delivery of the service. Deficiencies in human resources policies. Failure to match supply to demand. Employee lack of knowledge of the product. Lack of cohesive teamwork to deliver the product or service. If Netflix were to suffer from this gap then it could be because when the customer selects the show they want to watch it takes five minutes before it starts to play. In this case, the product isn’t performing as it should. If Pizzahut were to suffer from this gap then it could be that when the customer orders the pecan pie they are informed that the kitchen has run out. In this case, supply hasn’t been adequately matched to demand. The communication gap is the gap between what gets promised to customers through advertising and what gets delivered. Viewing external communications as separate to what’s going on internally. Insufficient communications between the operations and advertising teams. Communication gaps lead to customer dissatisfaction. This happens because what they receive isn’t what they were promised. In the worst case, it may cause them to turn to an alternative supplier. If Netflix were to experience this gap then it could be because that although the service is good it isn’t as good or as easy to use as depicted in the advert. If Pizzahut were to suffer from this gap then it could be because the pecan pie was good but it wasn’t as large or delicious as it looked in the advert. The customer gap is the difference between customer expectations and customer perceptions. This gap occurs because customers do not always understand what the service has done for them or they misinterpret the service quality. Many organizations can be completely blind to this gap. This gap can happen because of one of the other four gaps, or simply because the customer perceives the quality of the service incorrectly. In a worst-case scenario, it could lead to a business losing a large proportion of their customers overnight. Although the company thought there was no gap, the reality was that their customers were just waiting for someone to fill their perceived gap. 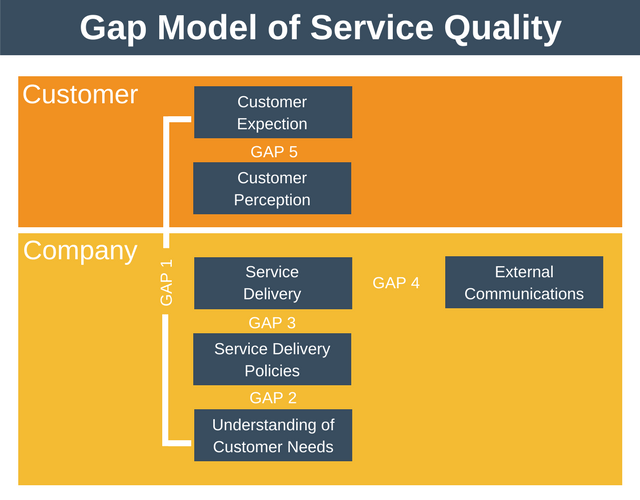 According to the Gap Model of Service Quality, the only way to close the customer gap is to close the other 4 gaps in the model. The extent to which one or more of these four gaps exist will determine the extent to which customer perceived quality falls short of their expectation. There is no way for the company to directly close this gap. When using the Gap Model of Service Quality, then once you have identified a gap you can use one of the following actions to reduce the gap. Increasing interactions between management and customers. Increasing interactions between management and service staff. Act on other customer insights you receive once validated. Ensure a good proportion of senior management remuneration is aligned to service quality. Set, communicate and reinforce quality standards. Set measurable service quality goals. Train managers to be service quality leaders. Reward staff for the achievement of quality goals. Provide the right technology, tools, and equipment. 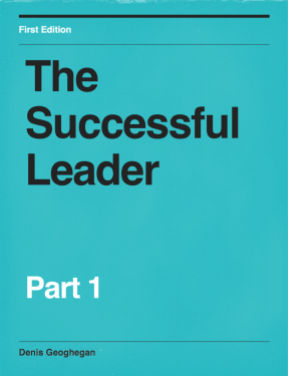 Take steps to retain high-performing employees. Getting employee input to your advertising campaigns. Use reality advertising by using real customers, real reviews, and real employees etc. Ensure advertising campaigns are signed off by the operations team. This gap can only be closed by closing the other four gaps in the model. Once this is done then customer expectations and customer perceptions should align. To use the model, companies should measure each gap and take steps to reduce them where necessary.